Every "Fly Fishing California" book I've either scanned through or read includes a part of the state that I've always wanted to explore, the Eastern Sierras. 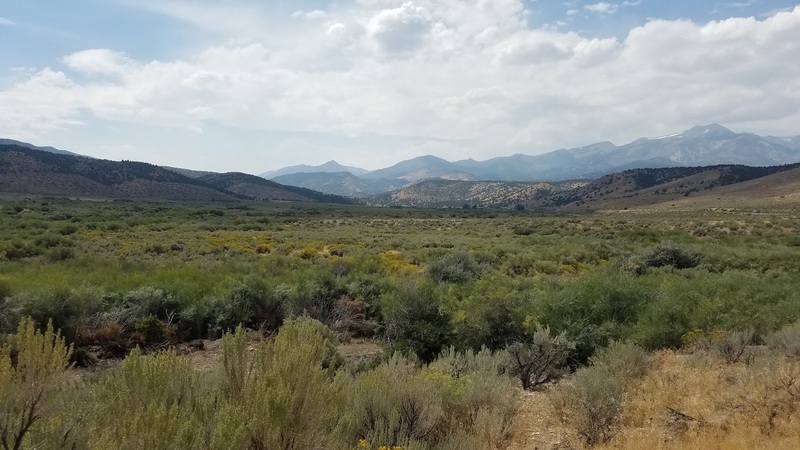 My eyes were set on the East Walker River and Hot Creek where I was hoping to hook into the monster browns and bows that were rumored to live there. For the next four days I would be living off of burgers, fries, coca cola, and soup while exploring the beautiful Sierras. 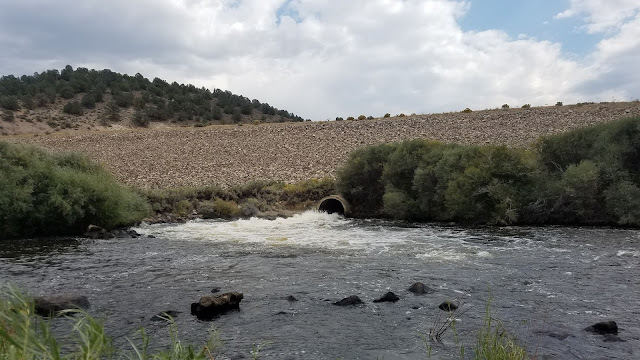 The East Walker River was flowing at a good 250CFS a few days before my trip however it was bumped up to 340CFS by the time I set out. 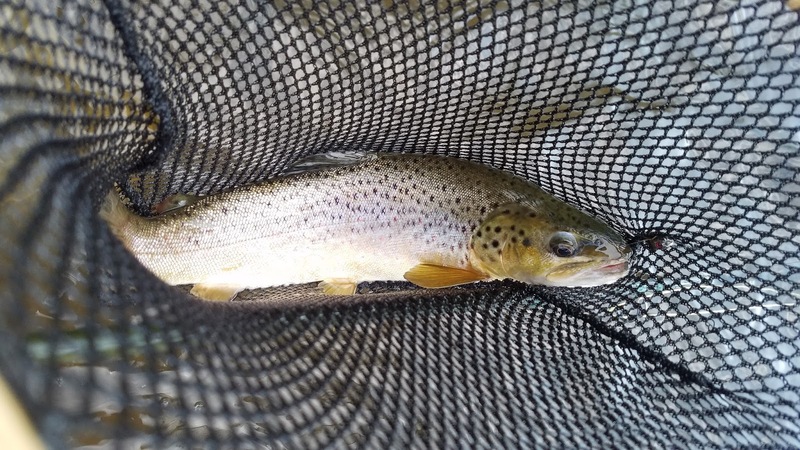 Although I've read that these flows are not the best flows the river was still very fishable. I made base camp at Paradise Shores which was very accommodating. Free showers, Wi-Fi, a place to cook my food, and only five minutes away from the river, I was going to be living like a king! The East Walker River is not a large river by any means. Most of the river is about ten to fifteen feet wide with a few deep slots riding along the willow covered banks. I spent most of my time fishing the Miracle Mile which stretches from the Big Hole to HWY 182 bridge. The water had a tea-colored tint to it with a lot of good vegetation growth. I was able to get around pretty easily and had little difficulty maneuvering around the Miracle Mile section at these flows. After setting up camp and wetting my line on the EW for the first time I noticed an important key factor to this fishery; there were a ton of things for these fish to eat. Along the banks I found and caught Sacramento perch, mountain whitefish, chubs, crayfish, and an assortment of aquatic insects. 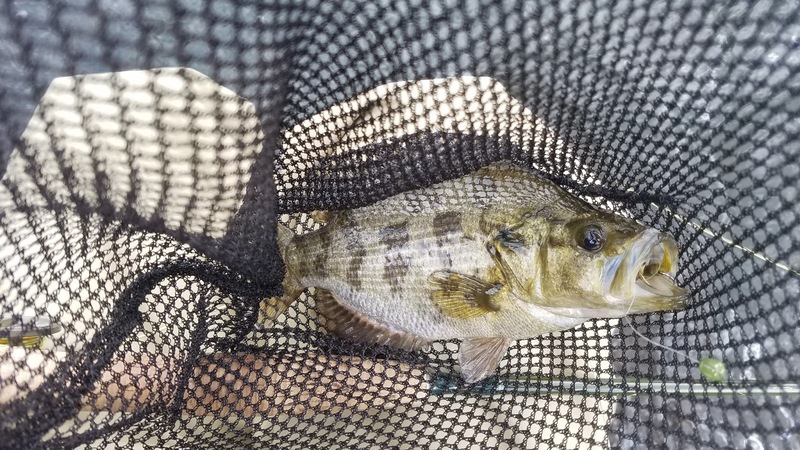 With enough feed to go around it's no surprise how these fish get so big. 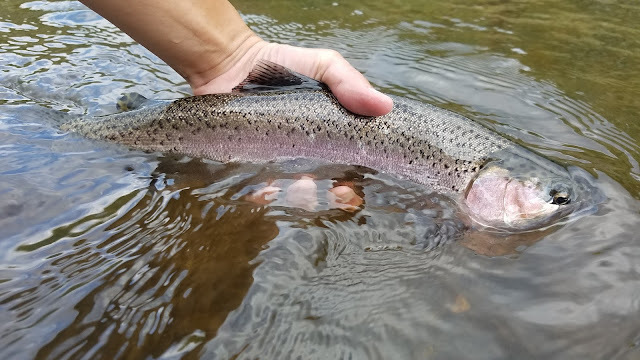 I spent most of my time throwing streamers hoping to entice a monster brown but 95% of the fish I caught were rainbows that were a quality 14'' - 16''. I caught so many rainbows that I started quick-releasing them once I got a good look at them. Throughout this visit to the EW I only caught three browns and a few new species that I happily added to my list. I spent three days fishing the crap out of the EW. 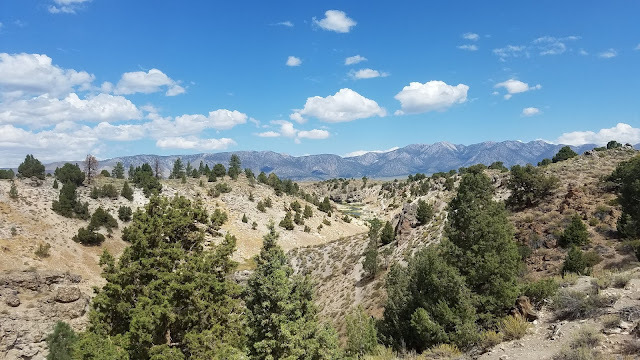 I explored the canyon section below HWY 182 and even bought a Nevada fishing license to check out the Rosachi Ranch section. Both sections were unfishable due to the higher flows which limited my trip to the Miracle Mile. 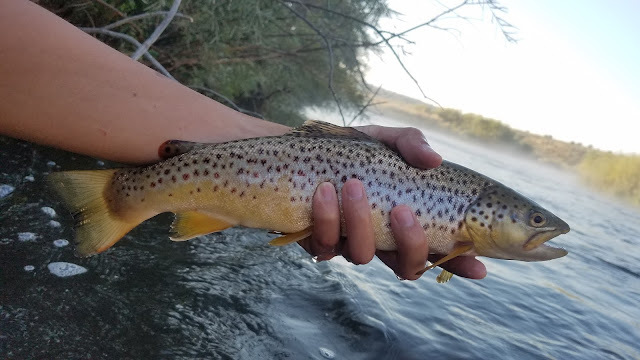 After three days of fishing my time on the EW was coming to an end so I decided to try my luck nymphing the last morning of my stay. I covered the same water that I'd familiarized myself with and hooked a nice brown but still nothing worth bragging about. 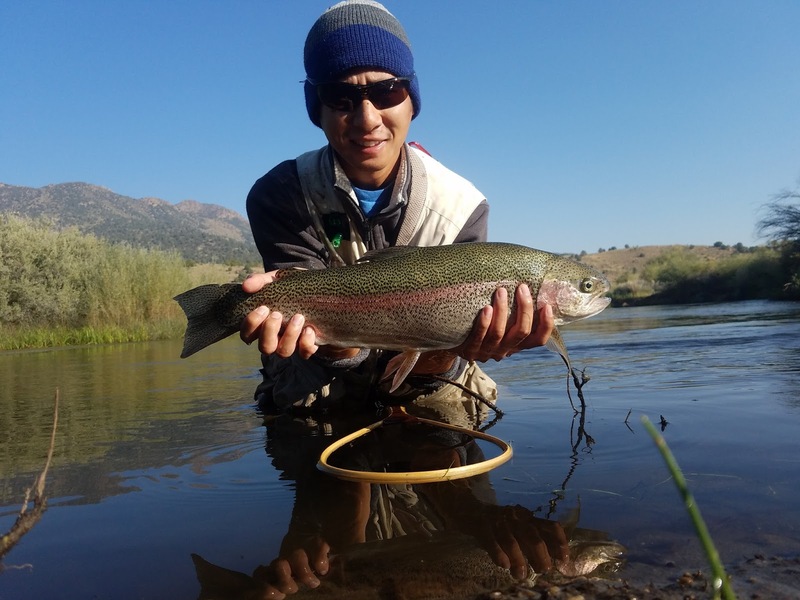 With check-out time looming closer and closer, I finally watched as my indicator went down and I felt the weight of a trophy fish. 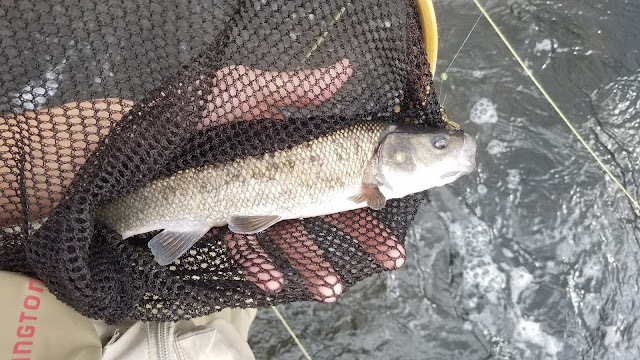 I played the fish quickly, netted it, took a few pictures, and called it a successful trip on the EW. 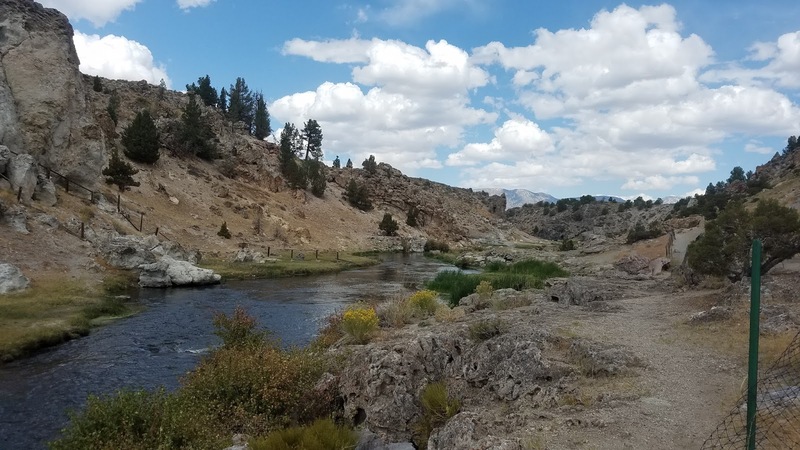 Hot Creek is an interesting fishery just a few miles outside of Mammoth Lakes. The public area that many anglers fish is a short one mile section between the end of Hot Creek Ranch and a thermal spring that to this day is still boiling hot. This section of Hot Creek runs through a small steep canyon surrounded by beautiful volcanic formations that look out of this earth. Full of wild browns, rainbows, and potential 20''+ trophies, Hot Creek was definitely an Eastern Sierra stream that I had to check out. 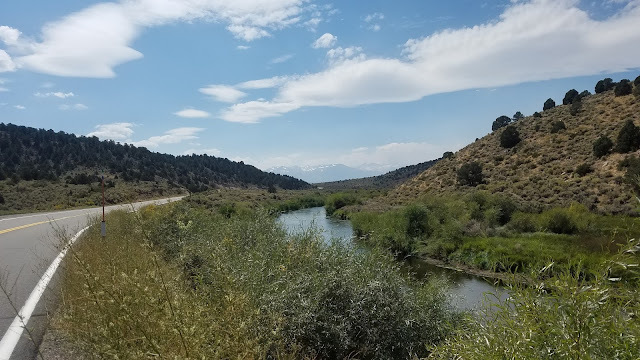 When I first arrived on Hot Creek I wasn't sure what to expect. I've read many articles about the creek but didn't have a mental image of what the creek looked like. I was surprised to find how narrow and shallow the creek was. I threw a hopper pattern for most of the day and caught browns and rainbows. After about two hours of fishing a thunderstorm rolled in and put the fish down. I switched to a hopper dropper and hooked a big 20'' rainbow but lost it in the faster current. Once the rain started coming down I decided to head to Mammoth Lakes to get something to eat. I returned later in the evening to check out the most northern end of the public access section. 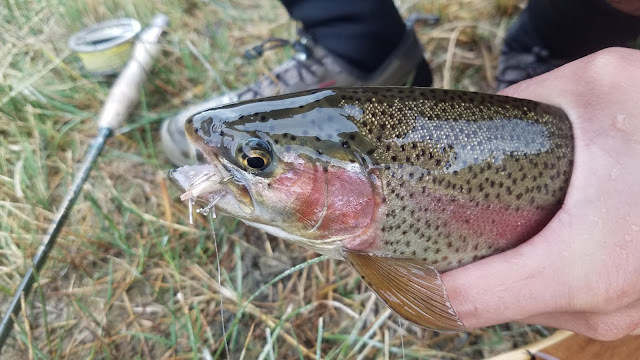 The hopper dropper wasn't working anymore so I had wait a bit for the fish to turn onto the caddis that were fluttering near the banks. 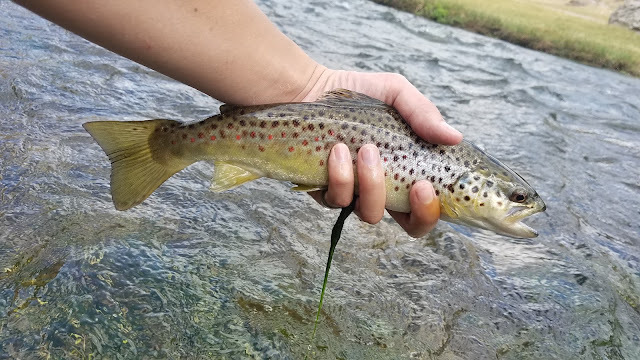 After catching a few small trout on dries I switched to a streamer pattern to try my luck at finding a Hot Creek trophy. I covered most of the creek and was able to hook two browns and land one. 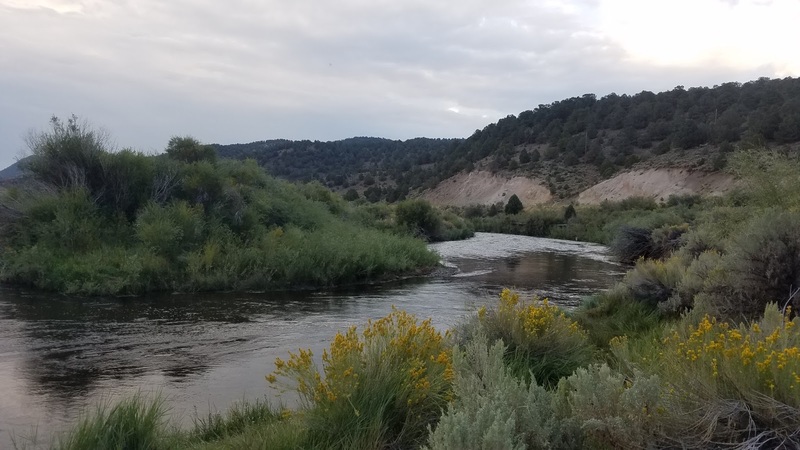 Hot Creek was a pretty cool place to visit and fish. It was amazing to see just how many fish inhabit this small stretch. 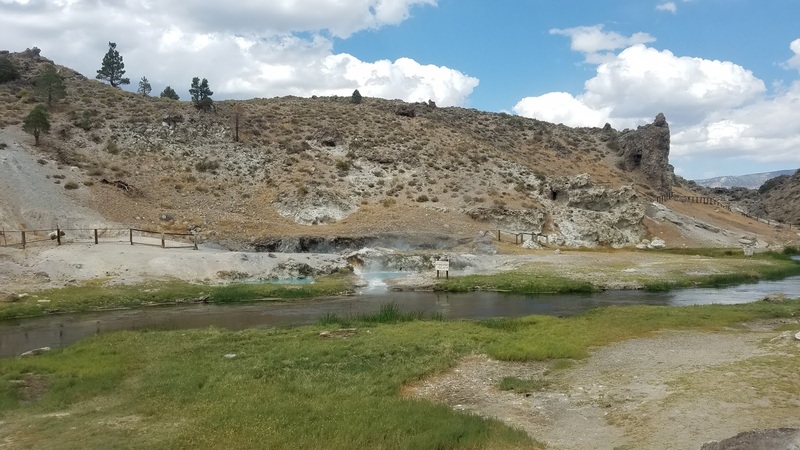 The geological formations that surround Hot Creek makes this fishery a must visit for those who have never been. The Eastern Sierras was quite the trip. I plan on doing it again someday focusing on some of the great stillwaters in the area. It was awesome! So fun exploring an amazing part of California.